Wondrausch Guildford jug - 4¾" (120 mm) high. 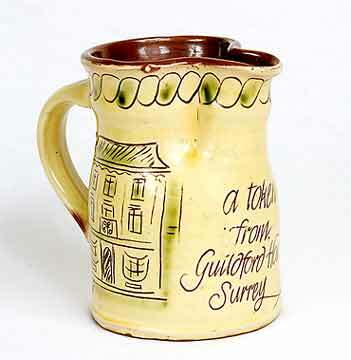 Mary Wondrausch, based in Compton, near Guildford, Surrey specializes in commemorative wares, made to special order. She works in slip decorated earthenware, usually with a painted design in slips and oxides and a honey glaze.